I write this as if it’s the only favorite unmanly thing I own or do. Honestly, though, I rarely care about what’s manly or not manly–I just do what I like. I’m confident in my masculinity. If there’s a drink called “Georgia Peach” on the menu, I’m going to order it. If there’s a catchy song in Pitch Perfect, I’m going to sing to it. No big deal. 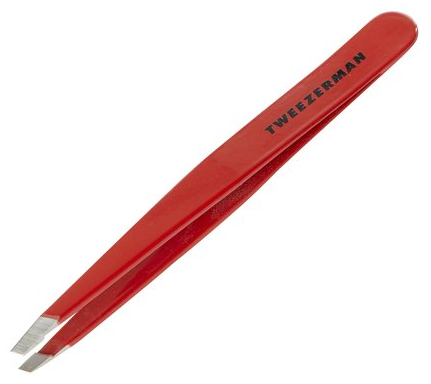 But today’s entry deals with something special, something private, something tucked away in the corner of my toiletry box: My Tweezerman tweezers. For most of my adult life, one of my weirdest indulgences has been to pluck the hairs from my face that my razor doesn’t catch. I use an electric razor because puberty only affected me halfway, and sometimes, no matter how many times I run the razor over my skin, it just won’t get certain hairs. It’s immensely satisfying to tweeze those hairs. There’s something satisfying about knowing that because you got the hair from the root, it’s not growing back for a while. However, for the longest time the only pair of tweezers I had were thin metal ones I permanently extracted from my Swiss Army knife. They’re decent, but they’re really flimsy, so it’s hard to get a good grip on a particularly stubborn hair. Enter girlfriend C., who gave me what is quite possibly the best present I’ve ever gotten from a lady friend: The aforementioned Tweezerman tweezers. As you can see from the photo, they’re made of firm metal, and the ends are slanted. The slant is key, because when you pluck a hair from your face, it’s almost always at an angle. I’m not alone here, right? You’ve all plucked a good hair in your day. It feels good, right? Imagine that feeling and multiply it by 100. That’s how it feels to pluck with a Tweezerman. As I get older, hairs sprout up in random places that simply need to be plucked. Those rogue hairs seem to come out of nowhere–one day there will be no hair, and then the next I’ll have a nose hair the length of my forefinger poking me on the upper lip. Same with ear hairs, neck hairs, back hairs, and an friendly family of three on the top of my left foot. I know, you don’t read this blog to get lists of my random body hair. But I’m sure you too have random body hair, and now you know the ideal way to extract it: Tweezerman. For you guys out there, what’s the most unmanly thing you own? And ladies, what’s the most non-feminine thing you do or own? If we embrace these things, they stop being manly or unmanly and just become things. This entry was posted on Monday, March 18th, 2013 at 8:52 pm	and is filed under confessions, personal and tagged with confessions, personal. You can follow any responses to this entry through the RSS 2.0 feed. You have just freely admitted to all of your readers what is one of my most shameful indulgences! My name is Katie, and I am a tweeze-aholic. As a woman, I keep tabs on the unruly eyebrow hairs of course, but the real pleasure comes from these two small spots right on my jawline, directly underneath the corners of my mouth. Out of nowhere, these super-coarse, stark-white old man hairs appear out of nowhere, and literally sprout up overnight. I can’t stand them, and if I notice one while I’m at work it bothers me all day long. And the first thing I would do when I walk in the door in the evening is attack it with my tweezers–before I even take my coat off, that hair has got to go. My manliest indulgence? Week before last, I went to the store and bought bratwursts for dinner, just because. A few weeks before that, it was a big juicy steak, cooked to medium-rare perfection. I didn’t even bother with side dishes; I just wanted the steak. Enjoyed with a nice cold beer, it was the highlight of my day. After plucking that chin hair, of course. A fellow tweeze-aholic! So nice to make your acquaintance. Were you not at last year’s conference in Tweezer, Michigan? I’m beyond relieved to learn that I’m not the only tweeze-aholic out there. I also have a single unruly hair that will randomly show up and suddenly be super long, despite the fact that I check the spot nearly every day while getting dressed. I was devastated a few months ago when I discovered that the tiny tweezers on my swiss army knife that I keep on my keys had fallen out of its spot to be lost forever (and have since resorted to keeping an “emergency” set of tweezers in my car in the event that I find a hair that needs to be plucked and I’m not at home). As far as manliest indulgences go, I’d say it’s probably the fact that I’ll use nearly any excuse to use power tools. Whenever I visit my parents’ house, I always check out the garage for any new tools, and then try to think of a project requiring said tools that I can work on while visiting. And, if I can’t think of any new projects, I’ll resort to tinkering with the train layout that my stepdad has in their basement (by helping plot out new expansions for the rail line, assisting in wiring the existing track to power, or simply running the trains around the board). You have a rogue hair too! Awesome. Does it have a name? Also, I’m quite impressed by your skills with power tools. Does admitting that the rogue hair has a name make me sound crazy, or is it crazy not to have named the little bugger? My manliest indulgence? Well, I don’t know if it’s manly per se, but I love guy movies. I will rarely spend money to go see a chick flick, but a solid war movie with guts, glory and honor? Hell yes, I’ll spend $10 to see it. The Avengers? I saw it 4 times in the theater. And I sometimes scratch my booty. Like, hand down the yoga pants scratching the booty. Unfeminine confession: When the mood is right, I’ll lounge around in my skivvies while eating pizza and drinking beer from the bottle (apologize for the visual). Apology accepted. And you too, Miss Yoga Pants. Captain America, Green Lantern, and Red Dead Redemption on Xbox 360. Just look at the Wikipedia image for Red Dead Redemption … pretty non-feminine. Lol. Ahhh, it took a good think, but I think the most unmanly thing I own is a hairdryer with a volumising attachment. Oh the shame! Rupert–That’s great! I think anything with the word “volumising” is inherently unmanly.